There are two movies of Britannia entering/ leaving Portsmouth. In the second of the movies you can see her paying off pennant running from her main mast. Britannia has been out paying her last visits to many of Englands Ports and Britannia returned to Portsmouth, as the above movies show, surrounded by crafts of all sizes and shapes and as they entered the harbour they all sounded their hooters and there was a fly past. The shores were lined with people to welcome Britannia into Portsmouth where they hoped she would stay. But this was not to be, it was announced shortly after her return that she would not remain in Portsmouth which had been her home for 43 years. 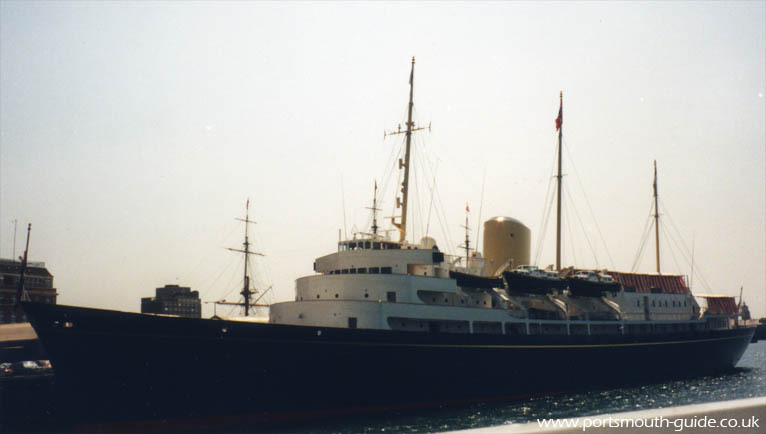 On Thursday 11th December 1997 HMY Britannia ceased to be a Royal Naval ship at her decommissioning ceremony. The day was dull and gusts of wind blew sailors hats off and the day got blacker, as if the elements were showing their disapproval at her decommissioning. The event was attended by many of the past and present crews and their families. The Queen along with many of the other Royals attended the decommissioning on Railway Jetty in Portsmouth Dockyard. There was a short service culminating with the last verse of Eternal Father Strong To Save. Then the Royal Marine Band performed Beat Retreat. Then bagpipes followed in a performance of Highland Cathedral. As the band played the traditional sunset the white ensign on board the yacht was lowered for the last time after travelling more than a million miles. There was then a rendition of Rule Britannia and then Heart Of Oak, a Life On The Ocean Wave and Auld Lang Syne. The daily routine of polishing Britannia's brass, swabbing her teak decks and constantly cleaning her cabins came to an end as she was decommissioned. Many of the people of Portsmouth including many ex crew of Britannia are sad that she will not remain in her home port but are at least glad she will not be scrapped.